Caesar salads have long been one of my husband's favorite dishes. We both like Caesar salads so much that we chose to serve it at our wedding at the Brooklyn Botanic Garden. 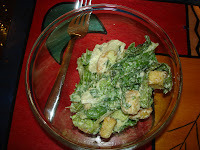 Before I learned to prepare my own Caesar dressing, others always told me about these wonderful Caesar dressings that they made and offered to share their recipes. However, I actually was never impressed, as these dressings were often too heavy on the anchovy flavor, not made properly (real Caesar dressing requires raw egg yolks), or were not creamy enough for my tastes. 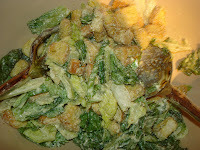 I have worked for awhile to perfect my Caesar salad recipe using the proper mix of ingredients. When I first started making it, I would often have to make it twice before getting the dressing to the right consistency, because it did not emulsify properly. This was obviously frustrating, and I have since corrected this by being sure to add the ingredients in the proper order and mixing in steps. The end result should be a classic, creamy Caesar dressing. 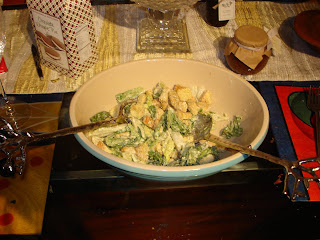 My husband and I chose to make this Caesar Salad recipe last night for our New Years Eve Dinner, which also consisted of Herb-Encrusted Rack of Lamb and Eggnog Tiramisu Trifles. Smear the garlic over the inside of a salad bowl and put aside. To make the dressing, put the anchovies, egg yolks, Dijon mustard, lemon juice and water into a food processor (like a miniprep) and process for 30 seconds. Add the Canola Oil in stages, blending in between to emulsify. Stir in the parmesan cheese and the salt and pepper. At the end, add 1 tsp of Worcestershire Sauce and be sure to use the brand Lea & Perrins (which for years, I called Lea & Pepprins, until my husband corrected me!). To make the salad, mix the dressing with the romaine lettuce and add to the bowl with the garlic. Top with croutons and parmesan cheese.